A rather scary-looking Akira from ARIA the Animation Episode 7. Aika has exceeded the speed limit (yet again). Her fear of her old habits doesn't go away as it is revisited at Origination ep11. Now the canals of Venice and the channels all have various speed limits, depending on how close to land (or island) the navigation channel is. The small canals have a 5km/h speed limit which Aika exceeded. I have also seen speed limits of 7, 11 and 20km/h and there are probably more. 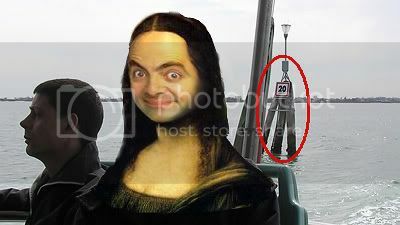 Here is Mona Lisa on a Vaporetto in a 20 zone! Why all these speed limits? Time for my trusty Lonely Planet book again. 1. A private craft left the navigation channel and cut inside at high speed of our boat while we were excecuting a 150 degree left turn at a "junction". 2. On my way to Burano, a water taxi overtook my Vaporetto at what must be twice our speed (we were at full cruise speed which would be the 20km/h limit). Giant cruise ships also cause wave damage. Huge sums are spent on preserving the barene - but little is done to bring the boat drivers to heel (Simonis 2008, p31). The Norwegian Jade docked at Venice. This ship passes right in front of Piazza San Marco on the way in! The Norwegian Jade is huge. 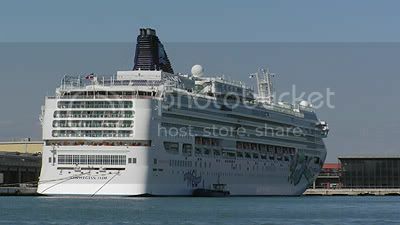 I've been on the Norwegian Spirit which was massive - the Jade is even bigger, but to be fair the ship was being towed at walking speed meaning the Vaporettos were actually producing more waves! More commonly known as Acid rain, but there is also "dry deposition". Akira's little outburst in Animation therefore uncovers far deeper issues that the real Venice contends with. If you really love Venice, don't use a water taxi and don't arrive on a cruise ship! Wow, I only knew that they were only discussing the need of speed limits. I didn't know that there were speed limits already. Or this is new? And, why I'm the only one commenting here? I have no clue when the speed limits came into force. This blog's only advertised in my sig at animesuki and another guy's review site which he says doesn't get too many hits. Guess there's the need to advertise but animesuki alone for me is enough for my anime stuff. It's really interesting to see how the little details you'd normally pay very little attention to add depth to an already excellent anime. Thanks for digging these details up and sharing them with us. 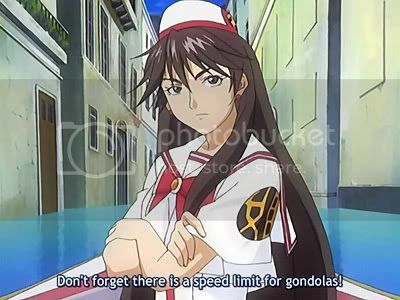 The reason for speed limits is mentioned in the manga, where Akira asks Aika to expound on why they must be careful to stay within the posted speed. Earlier this year, the New York Times had a video of touring Venice by inflatable raft, in which the condition of the buildings was mentioned. I can vaguely remember that chapter from skim-reading it at Book Off! The buildings in Venice are in a crumbling state indeed.